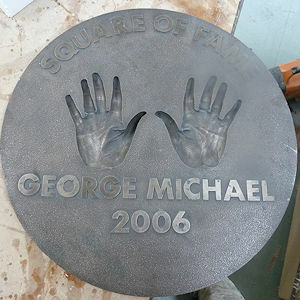 We have produced all the handprints in cold cast bronze that are sunk in the ground outside the new Wembley Arena in London and are currently working on a series for Sir George Martin's studios. We can produce plaques in many forms containing the handprints of Celebrities for a variety of clients for many different uses. Our technique is to take a handprint in our unique moulding compound. The cast can then be produced in a variety of materials including composition bronze, cold cast marble and fibreglass. Hands can be presented in one of two ways. 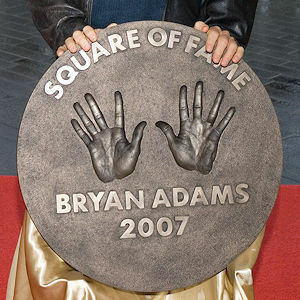 The print can be sunk into the plaque or alternatively the hand/hands can literally be seen to be coming out of the plaque. We have travelled far and wide to take these handprints. In 2006 Steve worked backstage with Madonna at Madison Square Gardens in New York. An impression of her hands was taken and 4 days later she did a presentation ceremony with the plaque in London. Copyright© 2018 - 2019 Articole Studios / All rights reserved.